I like the simple contrast in this photo. A man working on the CERN Large Hadron Collider - one of the most impressive engineering projects in history with it's 27 km long circular tunnel that is 175 metres underground beneath France and Switzerland. It is built to carry out one of the boldest scientific experiments in history. And the man pedalled to work on that bicycle there on the left. 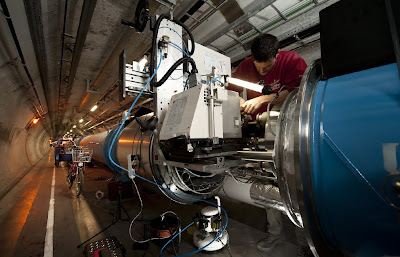 "Seeing this photo of a fellow member of the world's scientific community, I can't decide if I'm more jealous of the trails he gets to ride or of the fantastic LHC he's repairing." A propos nothing, CERN has quite a cool kids website with science games 'n stuff.